Im sitting here trying to figure out how I am going to put into words what mornings are like around here. I know you feel me, friends. The bundling up. The distractions. My three year old, Georgia, can be such a help, I swear. She’s responsible. The girl can get a job done. But there is, in no way, shape or form, a sense of urgency for this child to get out the door. Theres the need to attempt to button every single button on her sweater herself. Theres the But mommy I don’t have to go potty. Shes a little mommy with the constant need to have her baby doll right in the mix with all of us, too. Feeding her breakfast. Getting her coat on. Finding socks that will keep her feet warm. Yes, child, I love your nurturing side. I do. But please, please can you PLEASE just understand that the tiny baby doll you are obsessed with is absolutely not a priority when we are trying to get into the car. She has neither real circulation of blood nor working organs. She will not be cold if we don’t get her into full winter armor. And she, in fact, is not truly hungry. So when we are running late and we need to get to school…we do not need to ensure she has had milk with her breakfast. Packing her a snack is most definitely not a priority. It’s really quite sweet of you, but baby is not real. And then theres Jude. I swear the kid is a ninja. He needs a straight jacket in order to have his diaper changed. Putting on his shoes and coat are equivalent to, at a bare minimum, a 60 minute workout at the gym. The concept of sitting still will most likely never register in his brain. His ability to maneuver and succeed against any sort of child safety procedure is uncanny. He will find a way. Child locks on a vitamin bottle? Doesn’t phase him. Thats grounds for an entirely separate story. Gates? He will climb them. Those little safety plugs you put into wall outlets? Oh he gets them out of the wall…and into his mouth at the speed of a gazelle. And it wouldn’t be appropriate if I didn’t add in the fact that theres a small chance that I, too, could be part of the problem. I mean, do I really need to try to make that latte on our way out the door? Every single morning this is the conversation I have with myself in my head: Do not make that latte this morning, we are already running late. If it is that important to you and you are that tired you can stop and grab one at the coffeshop after you get Georgia to school. Thats five minutes we could save. Perhaps we could actually make it to the drop off line so that a teacher can walk Georgia into her classroom instead of us having to park, lug Jude out of his carseat and all walk in for drop off together. And guess what? Every single day I make that dang latte after having that conversation with myself. And every single day as Jude and I are walking back to the car in the freezing cold after walking Georgia into her classroom I tell myself that we can try again next time. Third world problems, I suppose. The point of that rant? Oh, yes, I was completely going somewhere with that. Breakfast. These bars. My kiddos are obsessed with them. They’re slightly sweet, perfectly chewy and so very filling. The ingredient list and nutrition profile definitely beats those store bought ones, too. And the best part? They’re quite the morning time saver when things like baby dolls and ninjas get the best of you. 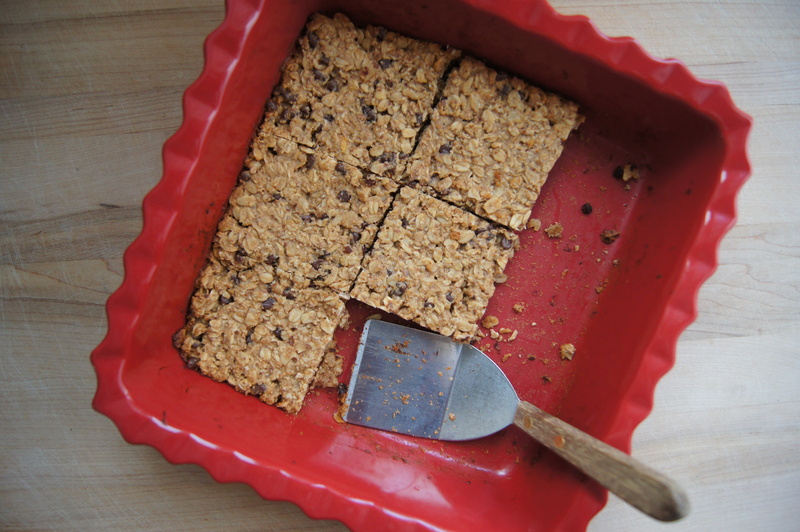 Notes: By using gluten free oats you can ensure these bars will be gluten free. 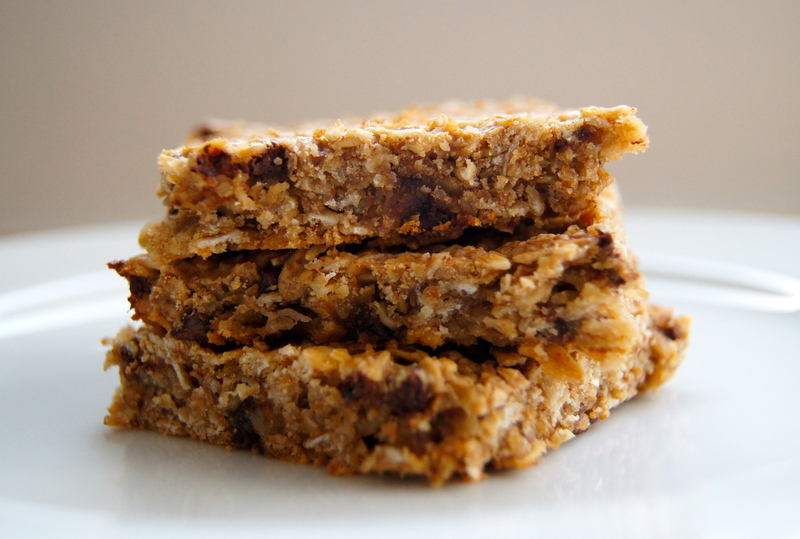 Also, you can substitute additional almond meal for the flax meal if you would like. Preheat oven to 350 and butter a 8×8 baking dish. 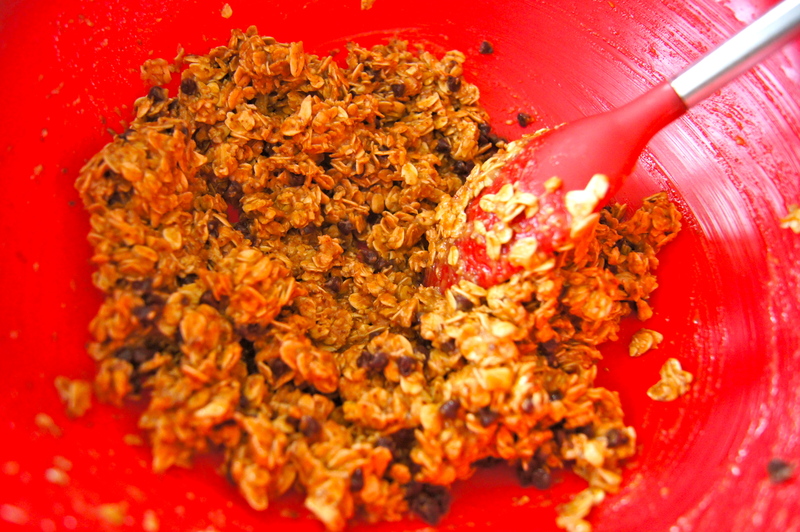 In a medium bowl whisk together the oats, almond meal, flax meal and salt. 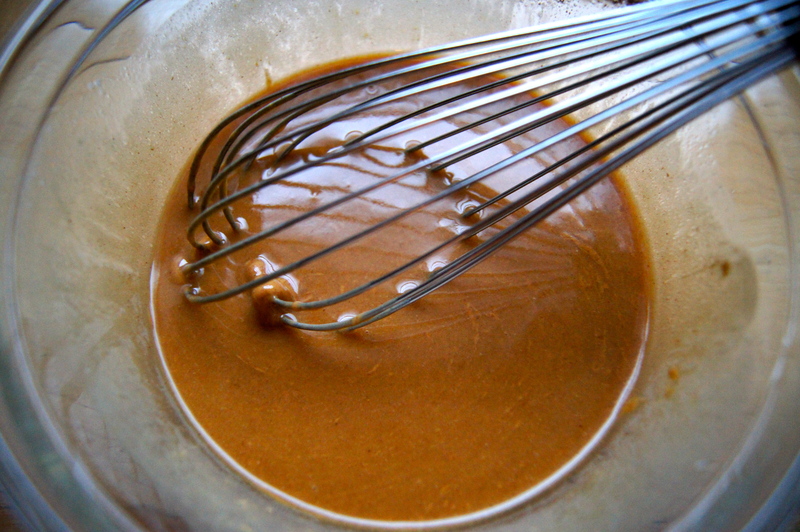 In a large bowl whisk together the peanut butter, honey, milk and vanilla. 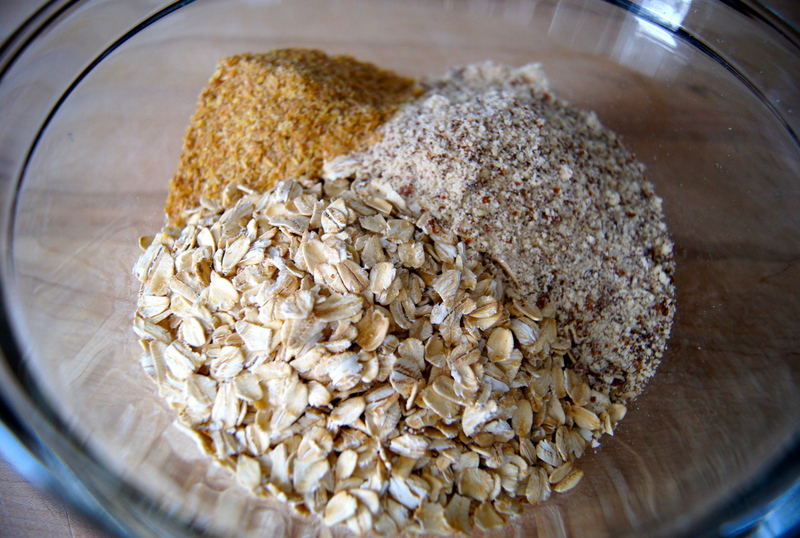 Stir the oat mixture into the wet ingredients until well combined. Stir in the chocolate chips. Using a spatula, press the mixture firmly into the prepared baking dish. Bake for 20-22 minutes or until the top is just begging to brown. Cool completely before cutting into bars.